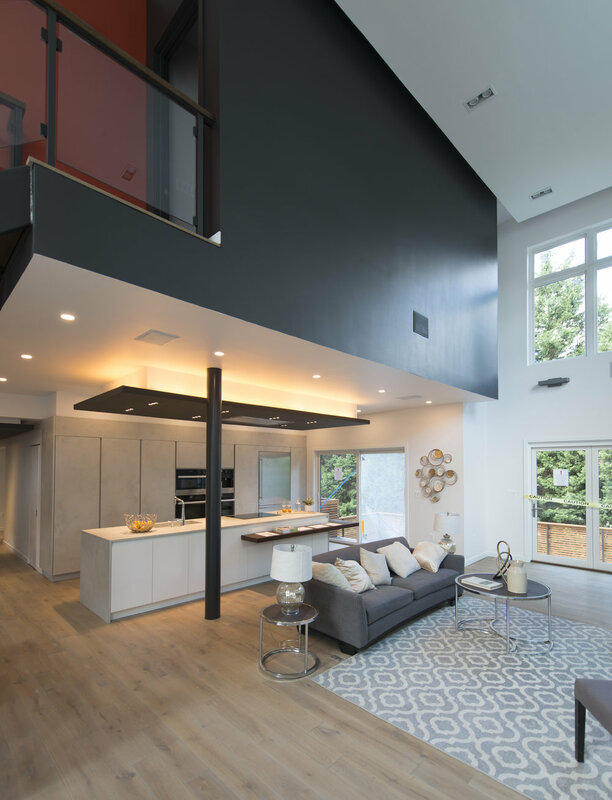 This project involved a major renovation and addition to a 1950's split-level house just outside the nation's capital. Previously, the home sat low on the site, the main floor occupying the lower level. To revitalize this home we raised the massing of the house, adding a sense of prominence and hierarchy to the existing monotonous facade, by adding a 3rd level master suite and double height living/dining spaces, along with a more welcoming entry stair off of the existing driveway. All systems were replaced, windows enlarged and replaced, all siding is new fiber-cement siding. All interior spaces were configured and the home now has a new kitchen, 5 bedrooms, 4 bathrooms, family room, mudroom, home gym, rear deck, stairs and fireplaces.